WSJ has an article on the anti-corruption drive in China. What is interesting is a data drive approach vs. testimony. "The procedures raise questions about denial of human rights," says Maya Wang, China researcher at Humans Rights Watch. In response, Chinese officials say Mr. Wang is encouraging his team to rely less on confessions and more on analysis of data. The effects that get the notice is on things like luxury goods and the economies. 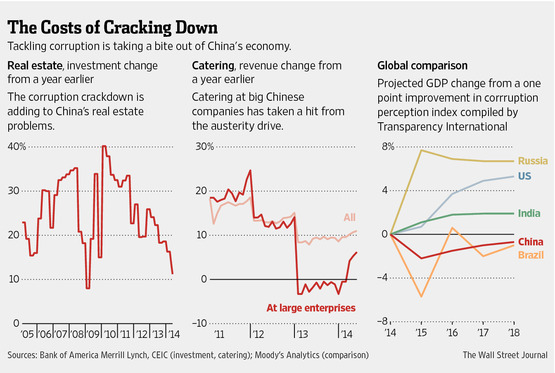 Lu Ting, a China economist at Bank of America Corp., estimates that the crackdown is shaving somewhere between 0.6 and 1.5 percentage points off China's gross domestic product growth this year, as sales plunge of luxury goods, high-end apartments and other baubles of the rich that could attract the attention of Mr. Wang's investigators. Government investment has also slowed because local officials fear that putting projects out to bid could open them to accusations of kickbacks. Over the long run, economists argue, tackling corruption produces economic gains because government funds are spent more productively. Jailing powerful officials in state-owned firms may also make executives wary of trying to block Mr. Xi's plans to introduce more competition in state-dominated fields. But all of that can take years. There are some good moves like recruiting staff from another province to investigate a different one. Mr. Wang has fielded a dozen investigatory groups and fanned them out around the country. Many are headed by a retired official of ministerial rank who hails from provinces outside the one being inspected. With all these efforts there must be some effect on data centers in China. It’s just a bit hard to find where things are documented.